STARSHIP TROOPERS football sponsored by "GoDaddy Coupon"
Recently on StorySmack (a podcast hosted by me, Scott Sigler, and AB Kovacs), we covered the 20th anniversary of the scifi movie classic STARSHIP TROOPERS. Love it or hate it, this flick has endured as a lightning rod of science fiction cinema. One of the things that makes the movie stand out for me is the use of football. I mean … obvs. 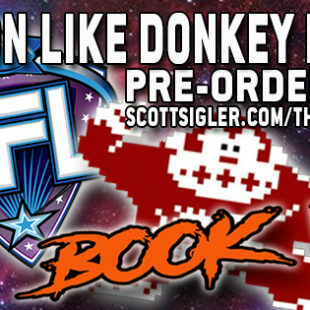 I’m five novels (and four novellas) into a massive, sprawling scifi tale that features American football as the backdrop. So, yeah, I might have found some particular appeal in that scene. You rarely see sports in science fiction. When you do see it, it’s either some crazy game that wouldn’t be suitable as a real pro sport for various reasons (such as DEATHRACE 2000 or Quidditch) or it’s fabricated from scratch for the book/movie (BATTLESTAR GALACTICA’s Pyramid Ball, ROLLERBALL, the “Thunderdome”). QB Dizzy Flores … a forerunner of Becca the Wrecka? 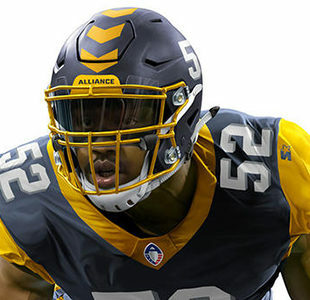 STARSHIP TROOPERS is an exception that uses American football — an arena football variation, in this case — as a way to let us modern-day peeps connect with our far-future kin. I mean, I’ve watched football, you’ve watched football at some point, our future peoples in Buenos Aires watch football … it’s almost like we’ve all parked our butts on tattered lawn chairs at the same tailgate and gotten proper crocked on Bud Lights and Pan-Galactic Gargle Blasters while we dined on Texas chili with kep-mok blood ticks cooked over a kerosene burner and a knocked back couple of tasty Saturn dogs heated up on a 3-gigawatt grill. As for the game actually played in the movie, it’s a highly caffeinated (and/or methed-out) version of American football. For a deeper description, I can’t top Germain Lussier’s write-up over at i09, so I’ll link to that in the footnotes. ARENA FOOTBALL ON THE UPS? The Arena Football League was founded in 1987 — ten years before STARSHIP TROOPERS came out. While the league has fallen on hard times since, in 1997 it boasted 14 teams with an average per-game attendance of 10,935. By way of comparison, Major League Soccer’s average attendance that same year was 14,619. While MLS continues to grow (2017’s average MLS attendance was 22,113), you can see that the AFL wasn’t doing that bad when TROOPERS was being filmed. Did the AFL turn out to be a huge success? No. Was it showing steady growth? Yes. And with it’s padded walls and confined spaces, darnit, it seemed like something that could be played in a spaceship. Futuristic indeed. According to the Starship Troopers Wiki, the game shown in the movie isn’t arena football at all — it’s called “Jumpball” or “Fieldball.” The “jump” part would make sense, as perhaps the field and/or gear is modified so players can do some flippy-do goodness like star running back ( … er … jumping back, perhaps?) Johnny Rico. BUT SCOTT, STUFF THAT DOESN’T HAPPEN IN REAL LIFE? The truth of the matter is pretty easy to guess — it was an artistic and budget-driven decision. Verhoeven didn’t care about commentary on overpopulation, nor did he give a squirt about the growth of the Arena Football League. He wanted a) something that was inherently familiar to the American audience — since it was an American film, and foreign markets weren’t as big a deal as they are now — and b) something that was easier to shoot than actual American football. All in all, the football scene of STARSHIP TROOPERS is an absolute standout in scifi athletics. It captures all the color of high school sports without one of those primary colors being blood-red (hello, HUNGER GAMES!) or using magic (not that there’s anything wrong with flying brooms, or Harry and Ron’s total bromance). Have any thoughts or memories about the sports scenes in this lovely cheese-fest of a flick (or on the superhuman flippy-doo action of messers Newton or Simpson? Let me know in the comments below. ** Why not basketball? Basketball doesn’t allow for the extra-cool, futuristic uniforms. Duh. This blog post sponsored by our “GoDaddy Coupon” page, which features the code CJCSIGLERC. Get a new dot-com domain for just 99 cents. It’s what Johnny Rico would have done. But…but…how could it be anything other than their natural athleticism, since they are able to run the Flip-6 3-hole during combat games?